When one of my favorite authors mentioned that John M. Ford was one of his favorite authors, it became a mission of mine to track down as many of his (widely-out-of-print) books as I could. It has taken me years to track the majority of them down (greatly aided by the internet in recent years), but it is taking me even longer to work through these stories. Two years ago I read one of Ford’s later books, The Last Hot Time, and really loved it. This time I opted for one of his earlier novels, The Princes of the Air. 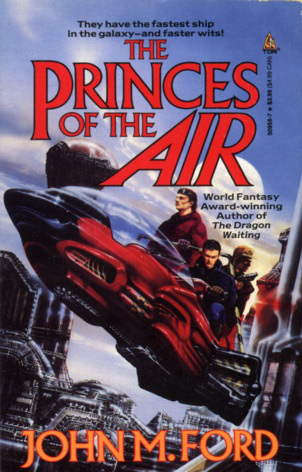 The Princes of the Air is a science fiction space opera about three grifters who long for a better life. They use their wiles to swindle unsuspecting citizens while dreaming of the day they will be able to fly away from their miserable life on Riyah Zain. Orden Obeck has sold himself into educational slavery – there is only one legal way off the planet for him, and that is proving himself to be one of the top diplomatic students at the university. His friends David Koleman and Theodore Cranach Valerian Norne have other options, but they are far too expensive without using their wiles to procure a little… assistance. Besides, if they are going to run off on a crazy adventure, they are going to run off together. They all dream of exploring far off worlds in the name of the Queen, and providing her their unique services. The novel follows the adventures of Obeck, Koleman, and Norne as they work to achieve their goals and have a far grander adventure than any of them ever imagined. The novel is seemingly made up of several disparate sections, which really only come together in the end. It is sort of interesting to compare to many more recent novels, where characters are followed almost reality-tv style through every minutiae of their lives. The book touches on a lot of the thematic tropes common to science fiction – oppressed classes, the nature of governments, and the trials and tribulations of growing up – all without actively making the novel feel like it is about any of these things. It touches on topics like depression and PTSD as well, which serves to make the main characters feel all the more human. They may be the princes of the air, but they aren’t untouchable. The Princes of the Air is the sort of book that made me question weather I was intelligent enough to read it as I was reading it. I was constantly pondering if I had really picked up all the clues that Ford was laying down. In contrast to so many of today’s works of science fiction, which read almost as if you were watching them on a screen, Ford’s novel leaves almost as much unsaid as he states directly. This skill is used in all of the writing throughout the novel, but is especially evident in his sections of dialogue. I have been called out for improperly using this terminology already, but the only real way I can think to explain this is to say that Ford is a master of using negative space – the reader has to read between the lines that are between the lines to really understand the complexity of what is happening as the story progresses. The book appears to be an un-intimidating 250 page pulp from the 80s, but it took me more effort to read through it than I’ve had to expend on epic tomes five times its length. I wasn’t really grabbed by the story and swept along (at least, not until the ending), but I was never bored either. This book required effort to power through, but in a good way. The reader has to put in a good deal of effort to keep up with the characters in the story. Well after having finished the book my brain is going back and forth between events and coming up with conclusions along the lines of “Wait, but that means he…. whoa.” I feel I really need to re-read it now that I’ve finished it so that I can better see all the beautiful bits of plot and foreshadowing that are woven into the story. Perhaps not right away, but eventually – probably after reading more of Ford’s other works. I would highly recommend this novel to any sci-fi junkies out there. Its got the usual bit of cool technology – spaceships, robots, etc. – but it also has an interesting mix of heist story, buddy comedy, “wizard school,” and hero’s odyssey thrown in to the mix. For non-genre fans, it might be a bit of a struggle getting used to the world and Ford’s prose simultaneously, though I think it is well worth the effort. All in all this book was a fun intellectual challenge, with a very satisfying conclusion.